New Rochelle, NY, September 20, 2018–A special Festschrift dedicated to the memory of Dr. Mathilde Krim celebrates her life and medical and scientific career, including her leadership role as the Founder of the American Foundation of AIDS Research (amfAR). Articles highlighting her life and legacy and a wide range of scientific articles contributed by the Krim Fellows are included in this issue of AIDS Research and Human Retroviruses, a peer-reviewed journal from Mary Ann Liebert, Inc., publishers. Click here to read the issue free on the AIDS Research and Human Retroviruses website. In the article entitled "CD4-HIV-1 Envelope Interactions: Critical Insights for the Simian/HIV/Macaque Model," coauthored by Amit Sharma, Fred Hutchinson Cancer Research Center (Seattle, WA) and The Ohio State University (Columbus) and Julie Overbaugh, Fred Hutchinson Cancer Research Center, the researchers demonstrate the importance of macaque models of simian HIV and infection with simian/HIV-1 viruses in the design of effective vaccines. Simian/HIV-1 viruses encode the HIV-1 envelope protein (env), which is an essential target in the CD4-HIV-1 interaction, virus entry, and the production of HIV-1-neutralizing antibodies. Ester Lopez and Amy Chung, The University of Melbourne (Parkville, Australia), Robin Shattock, Imperial College London (U.K.), and Stephen Kent, The University of Melbourne and Monash University (Melbourne), present "The Multifaceted Nature of Immunoglobulin A and Its Complex Role in HIV," in which they examine the dichotomy of published studies that show IgA to be either protective or harmful to the host with HIV. For example, with mucosal IgA evidence suggests a protective role, whereas IgA in serum seems to correlate with disease progression. "Fuzzy Modeling of the Enactment of Stigma by Healthcare Personnel Toward People Living with HIV in the Frame of Counterfactual Thinking: A Mixed-Method Approach," was coauthored by Zahra Alipour Darvishi, Islamic Azad University (Tehran, Iran), Fardad Doroudi, UNAIDS (Tehran), and Navid Madani, Dana-Farber Cancer Center (Boston, MA) and Harvard Medical School (Boston). The researchers' goal was to study the formation of stigma against people living with HIV based on the attitudes of healthcare providers. They identified six patterns of healthcare providers' judgments. They believe that their methodology, based on a more in-depth understanding of healthcare providers' judgments can provide more accurate predictions about healthcare providers' discriminatory behavior. 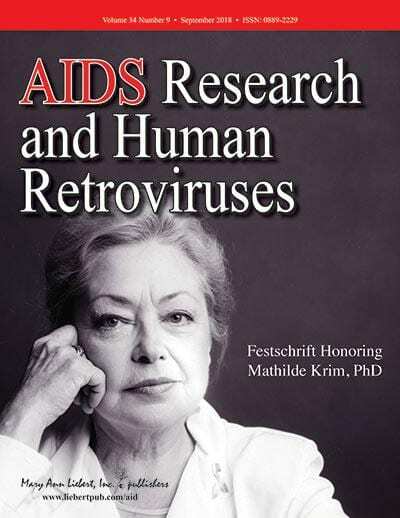 "This Festschrift is dedicated to the memory of Dr. Mathilde Krim, Scientist, Pioneer, and Founder of the American Foundation of AIDS Research (amfAR), whose legacy is perpetuated through the Krim Fellows Program that supports outstanding young HIV/AIDS researchers as they transition from advanced training to starting their own independent research programs," says Thomas Hope, PhD, Editor-in-Chief of AIDS Research and Human Retroviruses and Professor of Cell and Molecular Biology at Northwestern University, Feinberg School of Medicine (Chicago, IL). AIDS Research and Human Retroviruses, published monthly online with open access options and in print, presents papers, reviews, and case studies documenting the latest developments and research advances in the molecular biology of HIV and SIV and innovative approaches to HIV vaccine and therapeutic drug research, including the development of antiretroviral agents and immune-restorative therapies. Content also explores the molecular and cellular basis of HIV pathogenesis and HIV/HTLV epidemiology. The Journal features rapid publication of emerging sequence information, reports on clinical trials of emerging HIV therapies, and images in HIV research. Tables of content and a sample issue may be viewed on the AIDS Research and Human Retroviruses website. Mary Ann Liebert, Inc., publishers is a privately held, fully integrated media company known for establishing authoritative peer-reviewed journals in many promising areas of science and biomedical research, including AIDS Patient Care and STDs, Viral Immunology, and Journal of Interferon and Cytokine Research. Its biotechnology trade magazine, GEN (Genetic Engineering & Biotechnology News), was the first in its field and is today the industry's most widely read publication worldwide. A complete list of the firm's 80 journals, books, and newsmagazines is available on the Mary Ann Liebert, Inc., publishers website.